Born here at electro-music.com, comes a collaboration to titillate the senses!! 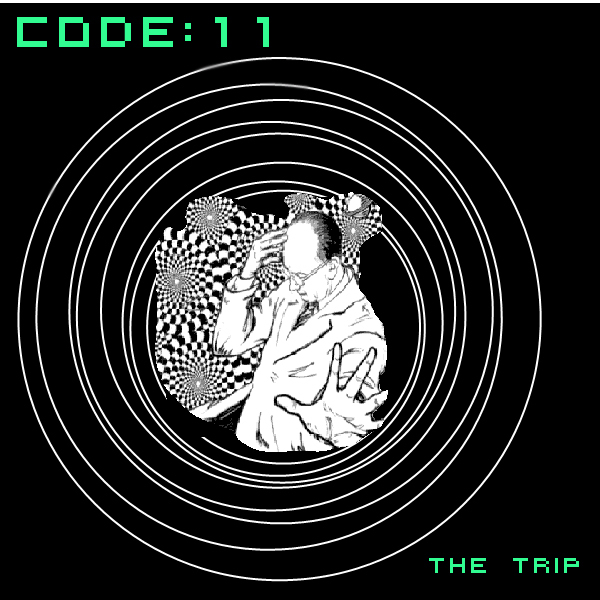 What began as an experiment, has now turned into a full fledged project called, code:11. This is the first Song we did. i've thought long and hard to try and describe the result…but it's no use. Let the music speak for itself!! Please join us for our EP Release ChatRoom Party on Friday, March 18th at 9pm Central US, right after Edison's Epherma. This song is definitely a trip. At first it grabs your attention and excites with swooshing sounds and rhythms. The audio chronicles a man getting very high on drugs and what he verbalizes throughout his session. IT is an extremely thought provoking work. I have been this man and i both like and dislike him. He deserves his fun but he takes it too far. Everything in moderation including moderation i suppose. The music does unfortunately get a bit repetitive in the middle and end of the song as i vaguely recall, but that did not stop me from listening to it seven times before i changed to auto play. Well done gentlemen, well done. It'll be a little more.. Looking forward .. you guys have been scheduled! It's been a blast working on these songs with Mr. Cold!! Can't wait for you guys to hear the next songs. Thanks for providing a slot on the radio!! i've been getting many people saying that this song sounds like Skinny Puppy. Which i never even thought of, ....crazy how your influences seep out whether you want em to or not!! but for beats/noise you'd like the newer albums. .....though some don't care for Ogre's singing...but all their programming and mixing work is INCREDIBLE!! and glad you enjoyed it! thanks for listening, and glad you enjoyed it! Looking forward to the EP release/party! I'll listen to the posted audio above ASAP. if this makes much sense: the new tunes are similar in mood and atmosphere, but pretty different in style. For one.. the drums are quite a bit more complex in just about every tune, and long samples play MUCH less important roles. That dancing banana should generate a tone, too. Wow, thanx everyone for the feedback!! The Banana makes a "whuh whuh whuh whuh" sound! !